AMACS supplies replacement-in-kind trays and tray parts for all existing conventional tray installations. We are your reliable source for complete trays, partial panels or various parts needed on bubble cap trays, sieve trays, fixed and floating valve trays installed in most existing towers. We specialize in quick delivery for towers up to 20 feet in diameter and with tray decks up to 1/4″ thick in common stocked alloys of CS, 410ss, 304Lss, 316Lss, and Monel 400. Traditional technologies provide time-proven, economically-sound options for the intimate contact of vapor and liquid which allow thermodynamics and chemical reactions to accomplish the process objectives of mass transfer. 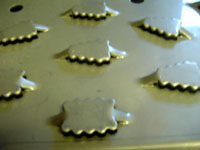 High Performance trays push the technology envelope in order to maximize capacity and efficiency. 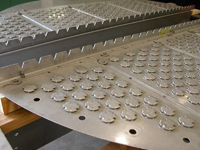 These trays increase profit by improving product yield and plant throughput. Call us today to get your trays or tray parts in hours or days, not weeks – at very competitive prices.